This spring we have upgraded the dishwasher to a new model with some quick wash and Eco wash settings. Please try and set the dishwasher to come on after 10:30 pm when possible as the electricity tariff switches over to the cheaper night time rate. ​If you are in bed by 10:30 then you can set the dishwasher on a 3 hr delay setting. We have bought a couple of new relaxer chairs to replace the oldest ones. That makes for 4 of the above type of chair, a Lafuma relaxer and a couple of folding Lafuma beach deck chairs available for your use. 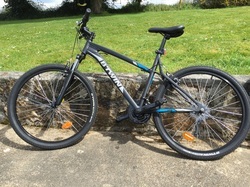 ​We have also bought a new trail bike, the same as the one we bought in 2016 from Decathlon, but in a large frame. We have updated the main TV in the TV lounge with a modern smart LCD unit with built in Freesat. The old Sky box did freeze from time to time, so was a bit of a pain. The new set works perfectly, and is connected to a DVD player if you would like to watch one of our many DVDs at the cottage. An additional feature of this smart TV is that you can use your own Netflix account, if you have one, to watch that channel via the internet. Unfortunately the catch up TV services like iPlayer won't work in France as they are only available in the UK. ​We have moved the older LCD TV to the main lounge and this also has a DVD player, so two different groups can watch different films, or if six want to watch a DVD it is more comfortable to do so in the main lounge. Although functional our toaster was starting to stick rather than pop the bread up so we have replaced it with another, exactly the same, as it is such a good toaster and suits long French baguettes perfectly. Our girls love toasting french bread for breakfast with their favourite jams. We particularly recommend the Saveurs gourmet range at SuperU and can vouch for the apricot, cherry, and strawberry ones! They also do some more unusual jams that you are unlikely to find in the UK such as fig, mirabelles and quince. Following some guest feedback that our double mattress was getting a bit soft we decided to renew it with a Which Best Buy sprung mattress from Ikea, which we hope you will find comfortable and help you experience sweet dreams! We always sleep really well at the cottage, which probably has something to do with all the fresh air and exercise, not to mention the peace and tranquility... and a certain zen that you can't quite put your finger on. We have decided to freeze our rental prices for yet another year. ​This means that our low and mid season prices have remained at the same level for ﻿6 years﻿, and our peak season price is held at the 2013 rate. We think our rental rates represents outstanding value for our guests, and hope you agree. We had an undercounter fridge and a separate undercounter small freezer which was always sufficient for our needs but some guests have suggested having more fridge space. When we spotted one on sale at SuperU that was it! We decided to install the new fridge freezer in the kitchen, and also retain the old fridge, so now I'm sure there will be more than enough space for all your food and drink. We now tend to use the larder fridge as a separate drinks fridge. As a thank you to those guests who return for their holidays to La Ville au Tady we now offer a 5% discount when you make your next booking within 12 months of your last stay. ​The 5% will be discounted from the standard booking rental charge and is not applicable to the optional bed linen and towel hire charges (which we charge at cost). We love cycling when at the cottage and try to keep our bikes in good condition. Recently we have been replacing some of our older bikes with better ones from Decathlon. This is our latest purchase at Easter. These trail bikes are great for cycling on road and canal paths and their chunky tyres are tough enough to easily cope with the quiet farm tracks that criss-cross the countryside. We have six bikes at the cottage of various sizes, plus a tag-a-long bike for young riders and a child seat. Use of our bikes is completely free, we just ask you to look after them and leave them in the same condition as when you arrived. ​When you take into account the six bikes, tag-a-long and child seat this is a benefit that could cost over 700€ a week to hire! This Easter (2016) while shopping at the supermarket we realised that we didn't have a cool box at the cottage. They are not something we tend to use ourselves, so haven't really missed it. We thought it might be a useful addition for those who like to travel by car for picnics or beach trips, so we picked one up. 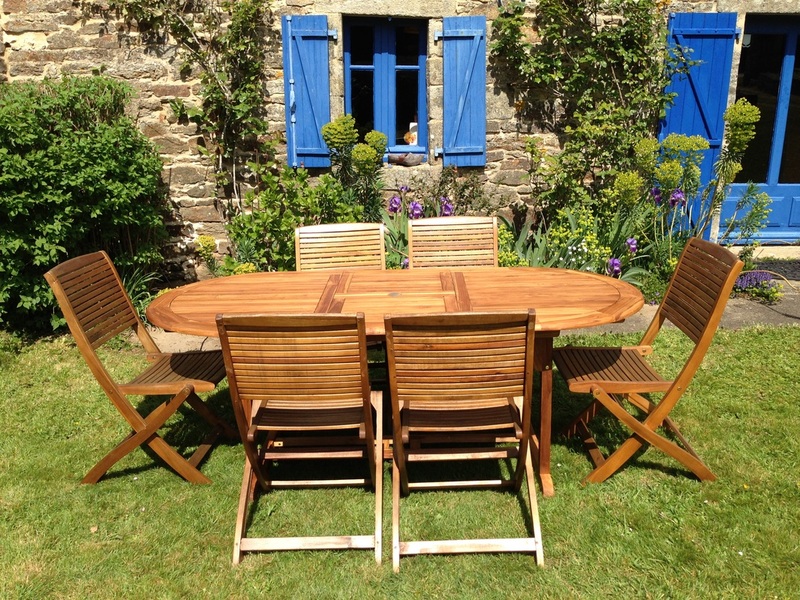 The French do love a picnic and you will find picnic tables along the canalside and in most villages. ​There are two cool packs in the freezer to keep your sandwiches wine & beer cold! Our DVD film library continues to grow, and I think we now have over 50 to choose from (we also have a selection of childrens DVDs). ​We have tried to ensure there are films to cater for a wide range of tastes and age groups, so we hope you should find something that you like if you enjoy watching films. We rarely find time to watch films when we are at the cottage ourselves as we are either out exploring, sat in the garden relaxing or doing one of many maintenance and gardening jobs. It doesn't get dark until after 10pm in summer, but they are particularly useful for off-season breaks. We have a larger TV & DVD player in the second lounge and another compact TV/DVD combo player in the main lounge in case you can't tear yourself away from the log fire. Every few years we arrange for a delivery of a lorry load of logs from our local supplier. Sometimes we are lucky and they can get the truck close to the woodstore at the rear of the cottage... this was not one of those years! We set about wheelbarrowing the logs from the front garden to the store which takes a few hours. All good exercise! The French sell wood by the cord which is a stack of logs 3 metres x 1 metre x 1 metre, and we usually buy 2 or 3 cords at a time. Although you will see woods everywhere, and signs of wood felling, logs are quite expensive if you buy seasoned hardwood logs like these. The logs have to be seasoned to get the water content of the wood down so they burn well. The logs are cut to half metre lengths so fit nicely in our massive wood burning stove. They are very heavy, so the best way to get them from the store to the cottage is using our wheelbarrow. We find 3 or 4 of these logs will last all evening in the stove with the air vents restricted and give off a great heat - the stove is rated at 14kw. Burning logs is CO2 neutral so that's good for the environment too. With many thanks to past guests who have left TripAdvisor reviews for us, we are now rated 'Excellent' on their site, with 25 reviews. ​Not only that, we are also pleased to say we have made it into the top ten best rated gites for the Morbihan region of Brittany (No. 5 out of 807 at last look), which is a massive vote of confidence in the cottage. If you want a very nice walk straight from the cottage door, try this one. This circular walk is one of our favourite evening walks, benefiting from the evening sun. 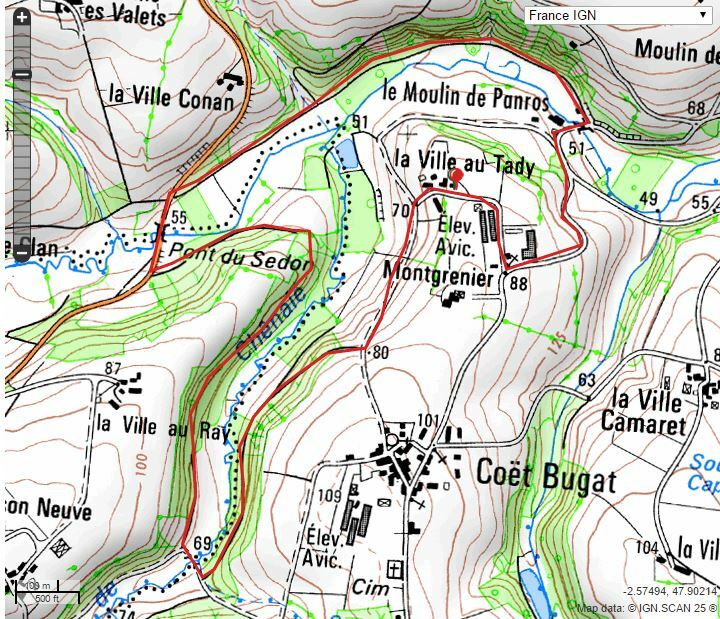 ​It takes in two sides of a lovely hidden wooded valley on footpaths and returns along a riverside track to the Moulin de Penroc (Mill house at Penroc). It's 3.1 miles so should take about 1hr or so. Click here to see the walk on Google Maps. Sadly our old Mimosa tree in the front garden died off and had to be cut down. We are not sure if it was a particularly cold winter or just old age that killed it off. This did present an opportunity for a new tree, and we wanted to buy something similar, but hardy. We chose Albizia julibrissin 'Ombrella', a popular small tree in Brittany which has lovely delicate leaves and distinctive bottle-brush style pink flowers in summer. We have replaced a couple of the older relaxer chairs at the cottage with new ones. We now have 4 of this style of relaxer chair plus a Lafuma relaxer. 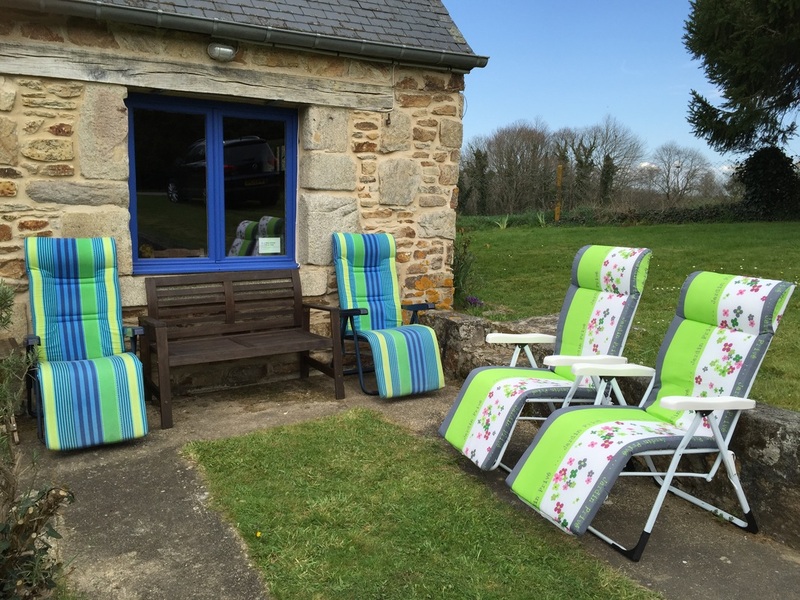 ​​We find these chairs very comfortable and are much favoured for post lunch snoozing in the garden on a sunny day! We have been looking to replace the old wall lights in the main lounge for a few years, but haven't been able to find anything we liked. ​We have now replaced them with new wall lamps, and increased the number from three to four, adding an extra light near to the kitchen end of the lounge. We think they suit the cottage really well. We also bought a floor lamp in the same series and installed a mini chandelier in the master bedroom with two new matching table lamps. ​With the advancement in light bulb technology we were able to convert all the lights to new LED bulbs, which provide 'instant on' lighting and use even less electricity to produce the same light and are claimed to last at least 25 years. 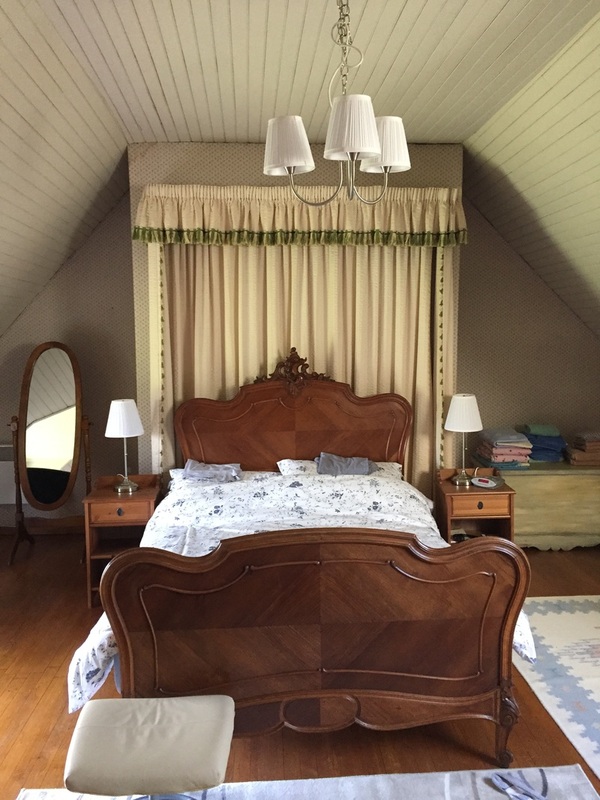 Over the years we have been renting La Ville au Tady we have received wonderful feedback from satisfied guests, and many of those comments are listed on our Guest Book page and in our Guestbooks at the cottage. All are 100% genuine, which is why we tend to attribute the comments to named guests. Some potential renters may prefer to read reviews which have been independently sourced and verified, so we now have a TripAdvisor listing where those are available. 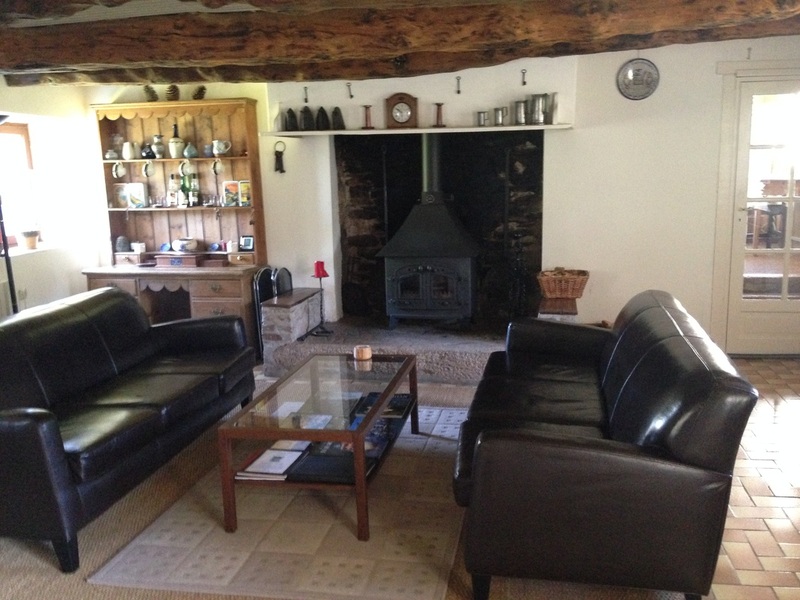 If you stay at the cottage and use TripAdvisor please add your review here. We have received some feedback regarding the low light levels in the kitchen. We found it adequate ourselves, but did wonder if everyone managed to find the under counter light switch! In an effort to meet most peoples needs we have now installed an additional triple LED ceiling spot lamp behind the wooden beam over the kitchen work surface. We now have 2 x wall lamps, 2 x fluorescent under counter lights, 2 x cooker hood lamps, and 3 x spot lamps. If you find you don't need all this light we have a separate overhead switch to turn the new spot lights on/off as you wish. Hardwood table and six chairs in the front garden. Hardwood table and six chairs on the rear patio. Front bench for two (a real sun-trap!). Wrought iron table and 4 chairs near the fruit trees. There is also a hammock and a chair hammock... so you should be able to find somewhere that suits to sit and relax! 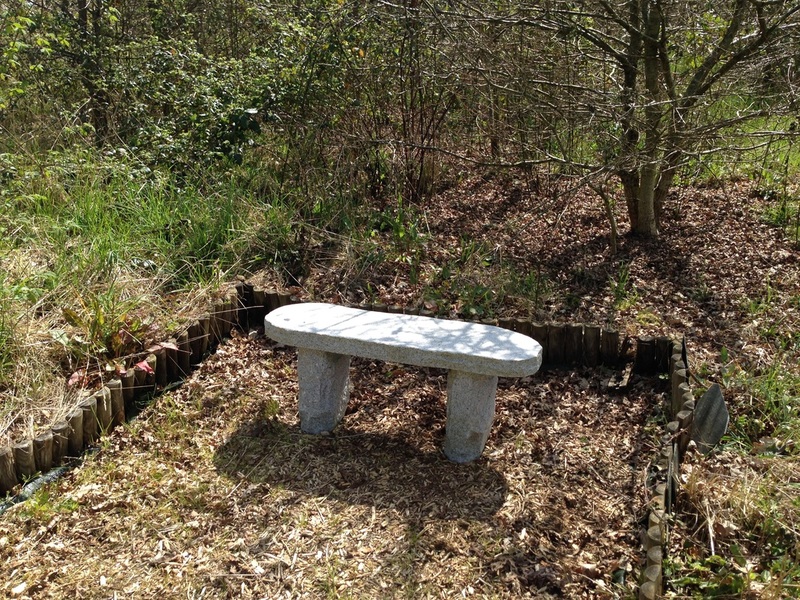 Half way around the mown paths in the rear wooded garden is a nice spot for a bench. We previously had a wooden bench here but thought it would be much nicer, and maintenance free, to install a granite bench... so here it is! The bench is located in such a quiet spot that you can sit awhile and enjoy perfect peace. In the summer you can watch Buzzards riding the thermals high above the surrounding fields. We think it is so wasteful for the cottage to remain unoccupied when guests could be enjoying a holiday, and contributing income to the local economy. 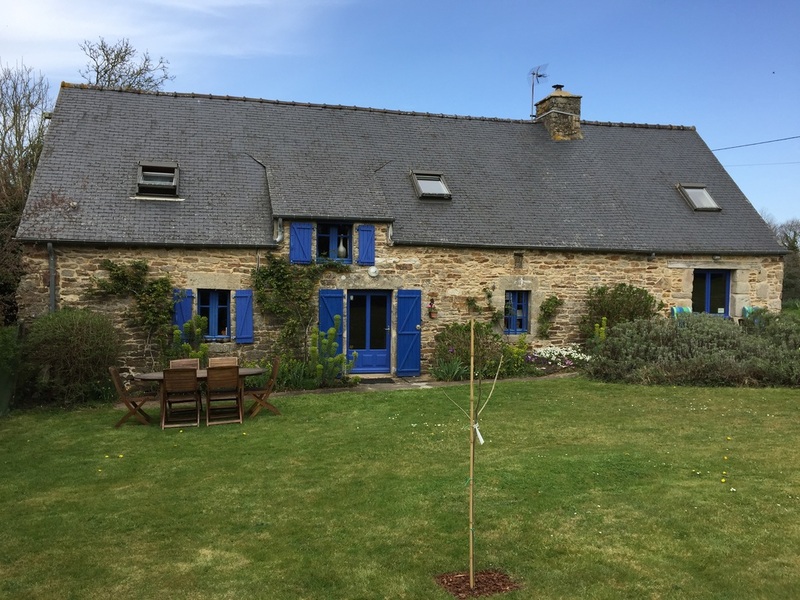 We would much rather the cottage be occupied than remain empty, and Brittany can be delightful in early spring and late autumn when demand for holidays is lower. Therefore, a 25% late booking discount can be claimed for bookings made within 30 days of the arrival date. Please quote the 'late booking discount offer' when you enquire if you wish to claim this special deal which applies to stays of 7 nights or more and does not include bed linen or towels. We have purchased two new sofas for the main lounge, a new washing machine for the utility room, and a new gas hob in the kitchen. The old sofas were nice but white fabric was a little impractical for a holiday home. ​The new sofas are comfortable and it's easy to clean any spills or sticky finger marks. We did love the open fire... but not the smoke, draughts, dust and the lost heat up the chimney! The stove is many times more energy efficient than an open fire and wood burning is CO2 neutral, so that is good for the environment too. After mulling the pros and cons of the situation we have succumbed to the many advantages of a stove. It is now installed, and throws out an amazing amount of heat (14kw), so now the cottage is even cosier for off season breaks. 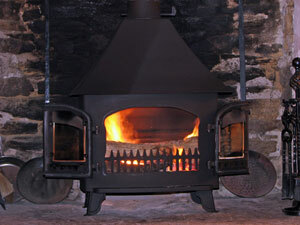 If you like the snap crackle and pop of the open fire you can use it with the doors open, but please use the fireguard. A free supply of logs is included in the rental, and you will even find a chestnut roasting pan to take advantage of the autumn harvest. Check out our Travel page for a summary of ferry timetables to see what options are available. Contact us for details of our discount code, which you will need before﻿ ﻿you book your ferry, which can be done either on-line or by phone. After trying various ferry companies we have concluded that Brittany Ferries are the best for quality and service. You do pay a bit more for that, but now with our discount code they are better value than ever. Bring your own lap-top, or use our lap-top for internet access & emails. We think that internet access these days if less of a luxury and more of a necessity as so many of us need to stay in touch with family and friends. Internet access is also great for checking the weather forecast and researching day trips. We provide this service completely free of charge. You are welcome to use our phone at the cottage and will be billed at cost for any calls made, although we will pay if it's no more than a few Euros. It is far cheaper to make outgoing calls via our France Telecom line, and free for you to receive calls - unlike your mobile phone where operators charge silly prices. For our first couple of years at the cottage we didn't bother with a TV but following feedback from some guests, we decided to install a satellite dish and free to view channels are now available (ITV, BBC, CBBC, News 24, UK Radio etc.) on the second lounge TV, a 26" LCD Nicam stereo model. If you would rather a TV Free holiday, as we often do, don't switch it on! The main lounge remains TV free, but you can use the DVD player in there to watch films if you wish. We have a good selection of films on DVD for your use at the cottage. Memoirs of a Breton Peasant. A fascinating account of what life was like for a rural peasant in the 1800's in Brittany. A gift from Brittany: A Memoir of love and Loss in the French Countryside. Bumping Around Brittany. A guidebook with a difference, a series of excursions into the cultural, physical and emotional heartland of Brittany. The Next Moon: The Remarkable True Story of a British Agent Behind the lines in Wartime France. There is also an good selection of thrillers and fiction books, some left behind by previous guests, so if you don't want to weigh yourself down with holiday reading just turn up and select something from our book shelf.